Acura was named the top luxury brand in Edmunds.com’s 2015 Best Retained Value Awards. This is the fifth year Edmunds.com has awarded brands and individual models for projected resale value, and Acura has taken home top honors in the luxury segment for four years in a row. With advancements in automotive technology and performance coming every model year, a car maintaining its value is more important than ever. Edmunds.com compares the value of a car at purchase to the projected value of that same car after five years, and Acura was tops among all luxury brands at an estimated 46.9% of its value after five years on the road. Toyota was awarded the highest marks among non-luxury makes at 52.4% value retention. Acura’s recognition as the best brand at retaining value was just the tip of the iceberg. Edmunds.com also recognized the 2015 ILX as the best entry-level luxury car, the 2015 RDX as the best entry-level luxury SUV, and the 2015 MDX as honorable mention in the midrange luxury SUV category. No luxury brand had more winning vehicles in this year’s awards than Acura. This success speaks volumes about what Acura strives for. While many luxury vehicles are flashy and impressive initially, Acuras manage to toe the line between a powerful first impression and lasting appeal and value. Whether you’re interested in a car that will retain its value over a few years, or are looking for a vehicle that is built for the long haul, Acura is in a league of its own. 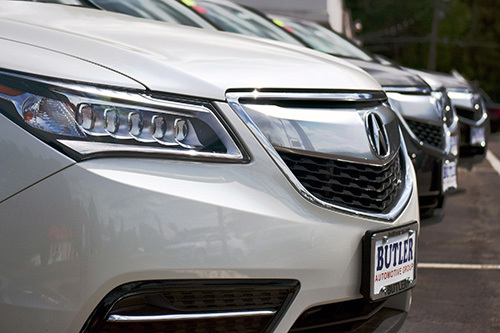 If you would like to see any of Acura’s award-winning lineup, stop by Butler Acura today!